This single-story, first floor beachfront condo includes all the features vacationers and residents need for an unforgettable experience. Soaring cathedral ceilings and panoramic ocean views fill the two bed, two bath space with refreshing coastal breezes from the Caribbean Sea. The shady, landscaped courtyard outside features a community swimming pool that is ideal for entertaining on hot days or laid back evenings. 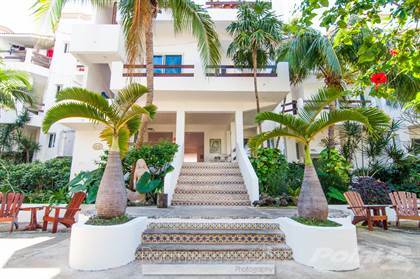 There is even a covered patio for appreciating the remarkable seaside in any weather.\r\rThe home is dominated by gorgeous views of Akumal. The formal dining room is set with ample windows that are just steps away from the Akumal’s sparkling bay, known for snorkeling and calm waters. It is the perfect place to read and enjoy morning coffee. The apartment’s tiled finish lends a rustic charm to the space; especially the kitchen, which is well equipped with appliances like a gas stove, oven and refrigerator. If your guests need help with anything, the building’s front desk is always available to answer questions.\r\rAkumal is a hidden gem in the Riviera Maya and is revered for epic snorkeling spots and small town charm. You’ll find everything you need in town and the larger communities of Playa del Carmen and Tulum are each just 45 minutes away. The Riviera Maya has become one of the most popular vacation destinations in the world attracting more tourists year after year.\r\rThis is an excellent opportunity to for a desirable vacation rental or amazing home for your family.\r\rContact our agents for more information today. Hi, I'd like to find out more information about La Sirena 3. Thanks so much!